When to Use Hot Water – For whites, typically dirty clothes and diapers, use hot water (130°F or above). Hot water is best to remove germs and heavy soil. However, hot water can shrink, fade and damage some fabrics, so be sure to read your clothing labels before selecting the hot option. When to Use Warm Water – For man-made fibers, knits and jeans, use warm water (90°F). Most of your clothes can be washed in warm water. It offers good cleaning without significant fading or shrinking. When to Use Cold Water – For dark or bright colors that bleed or delicate fabrics, use cold water (80°F). Cold water also saves energy, so it is a good choice if you want to be eco-friendly. If you choose cold water, you may need to pre-treat or pre-soak your clothes if your laundry items are heavily soiled. Also, it’s important to note that the lower the temperature of the water, the more detergent you need. If the temperature of the water is below 60°F, no soap or detergent performs well. But don’t make the water too hot. Washing heavily soiled articles with hot water can set stains. For heavily soiled clothes, prewash them in cool water, then wash them again in water that is 130°F or higher. The rinse water can always be cold without any harmful effects on the wash load. 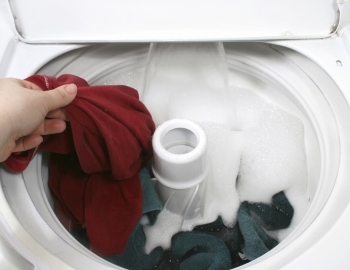 If you rinse the fabric in cold water, it will reduce wrinkling, save energy and it won’t set stains.